There’s nothing like a furlough to jump-start the satire for the New Year. 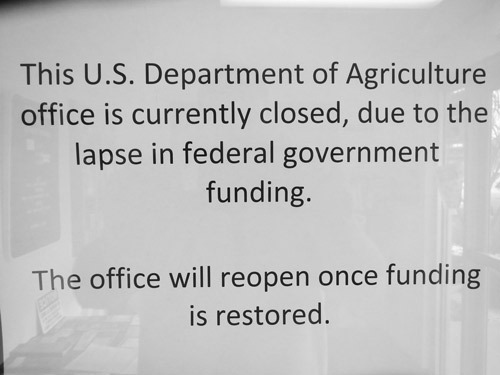 As we welcome in 2019 the U.S. government and the USDA are shut down or have been. It’s starting to become a yearly habit. It got me to thinking, what if all the farmers in the USA decided to shut down, take an un-paid leave and not send any products to market? What would it look like? Is it even possible? I hear government employees are concerned with not getting a paycheck and possibly going on unemployment if the furlough continues too long. Generally, farmers can’t even get this help. What’s a resiliency plan for an employee or any consumer? Experts say, “At a minimum, you should have three months of living expenses in your emergency fund” to get through something like this. The trouble is the green stuff ain’t very edible. It begs the question, what’s the average household’s food inventory to weather a farmer shutdown? Down on the farm, the demeanor isn’t stellar. We could use a solid week or two off to recharge our emotional and physical batteries just like 99 percent of the population. ‘OMG, what about the animals, the crops, the markets, the well-being of a nation? How will we survive?’ consumers may ask. I’m scratching my head, cause in America, I can “get” something in my belly 24/7. I mean really, it’s not like we’re in a depression era. Let’s play a hypothetical game. What if farmers provide extra feed for their animals, water their veggies and curtail all harvests for a week so every one of us in America could sleep-in, spend quality time with our families and do anything we wanted without having “to work.” Can you imagine what that would look like, all those farmers just sitting around relaxing? What’s the national food resiliency policy? How long would it take for there to be stress for citizens? I hear it’s three days for New York State. Is it selfish to enjoy a furlough while others are “hangry”? Overseas, if farmers stop, there is immediate chaos. If it lasts, prices spike and riots occur even though the farmer relaxes with his own personal bounty. I’ve read the disparaging comments, how dare they: those ungrateful farmers? Kinda makes you appreciate the agricultural craftspeople doesn’t it? In 2019, everyone around the world is reliant on farmers and the products they steward. Could we get a little appreciation from citizens and political leaders? Can we have a national dialogue on food sovereignty, foodshed resiliency and sustainably investing in farmers so we all could take a paid vacation and consumers can still have their grocery aisle fully stocked?